The retailer gets a lot right with its new reader. Too bad it's so damned expensive. I've been using Amazon's Kindle e-book reader for about a week now, and I like it quite a bit. Here is a truly novel gadget, a device that delivers a fantastic service -- thousands of books anywhere, on the go -- in a pleasant, mostly hassle-free package. If you're on the fence about the utility of an e-book reader -- if you doubt that reading e-books can match the experience of reading "real" books -- a few hours with the Kindle will do much to change your mind. Still, there's a great deal Amazon could improve on. Its $400 price tag, its zany user interface, and some of its sillier restrictions make the Kindle a non-starter for all but the travelingest, readingest early adopters. Reading: Obviously this is the most important function of an e-book reader, and the Kindle nails it. Shortly after I got my Kindle, I bought an e-book of "The Nine," the New Yorker writer Jeffrey Toobin's look at the Supreme Court under Chief Justice William Rehnquist. And just as Amazon's marketing copy promised, within a quarter hour, I forgot that I was reading something other than print. The device fell away. This was not an e-book: It was a book. Much of this effect can be credited to the Kindle's display, which is constructed out of a kind of electronic ink that mimics the qualities of print. The text is sharp and clear, and, best of all, customizable. Though you cannot alter the main font -- all body text is rendered in a serif type called Caecilia -- you can select one of six font sizes. When you adjust the scale to a level you're comfortable with, the type is far easier on the eyes than words on a computer or PDA display, and it gives small-print books some competition, too. Like a book, the Kindle's screen is not backlit, so you can't read it in the dark (as you can, say, an iPhone). But unlike an iPhone, a laptop or any computer screen, you can read a Kindle in very bright light (as you can a book). This makes the device extremely portable -- read it on a train or the bus with the sun streaming in, read it on the beach (don't get sand on it), read it on a plane with the cabin lamps shining up above. An additional benefit of e-paper is its low power consumption. I charged up my reader after four days, but even that was before its battery had fully emptied. E-ink come at a cost, though: This display responds more slowly than a mime at a parliamentary debate. Every time you change the picture on the screen -- when you bring up a menu, browse Amazon's online store, type letters into the search bar, or turn the page -- you've got to wait a half second or so for the display to refresh. Initially, this sticks in your craw, especially as a brief flash of black ink covers the screen each time you change the page. Happily, though, it takes little time to adjust to the pause and the flash; in the same way that you don't notice the work it takes to flip a page of a real book, the Kindle's quirks cease to be of much significance. What matters is the content, not the medium. In the time it takes you to wait in line at Barnes & Noble, you could buy a half dozen books on Kindle. The store, which knows you from your Amazon account on the Web, ties together Amazon's retail innovations -- "one-click" buying, customer reviews, personalized recommendations -- to mainline books to you on the go. And they're cheap. Kindle's books, granted, come with more restrictions than do printed books. You can't trade them with your friends or sell them when you're done with them (but you can "share" e-books; that is, you and your spouse can tie both your Kindles to the same Amazon account, and any book you buy can be read on either device). Furthermore, buying a full library of Kindle books is an iffy long-term prospect -- what if the Kindle fizzles out? But to make up for the restrictions, the prices are lower than those of most paper books. The hardcover of Stephen Colbert's new book sells for more than $16. On Kindle, it and most other new releases are $9.99. Older titles are less. Amazon sells the paperback of "The Tipping Point" by Malcolm Gladwell for $10.17. The Kindle version is $7.99. And, of course, the Kindle offers some advantages over paper -- better portability, for one, as well as text search and a built-in dictionary. The design: Folks call the Kindle ugly, but that's slightly harsh. A white plastic rectangle that tapers from thick to thin along its depth, the thing isn't iPod-pretty, but you could walk into a gadget shop and find a million items worse off. More than anything, the device, with a clutch of tiny buttons under its 6-inch screen, brings to mind an oversize graphing calculator, the nerdcore sort that separated the geeks from the chaps in high school. It's not a status symbol, but if you're reading a book to look good you've got the wrong idea to begin with. The Kindle is comfortable in your hands. It's got good weight -- about that of a paperback -- and a soft rubberized back panel that is nice to hold on to. Early users have groused about its buttons: Along the Kindle's right side there's a huge Next Page clicker, while on the left you find a small Next Page and a big Prev Page. When you're holding it with your right hand it's easy to advance to the next page by clicking the big button; but if you're holding it with your left hand, you've got to click the smaller button to flip the page forward. Because one tends to switch hands often while reading, the layout causes a cognitive nuisance -- you've to think for a second about what to press. I wish they'd flip it -- that Amazon would make the big button on the left go forward rather than backward -- but the flaw is minor. Generally, the buttons feel good and responsive; the QWERTY-style keys, which you use mainly to type out search queries in the store, are easy to find. Using two thumbs, they yield words and phrases much quicker than on any cell. The interface: By far the oddest thing about the Kindle is the little scroll wheel perched above its keys on the right. The wheel is there because the e-ink screen can't refresh fast enough to handle a mouse pointer. When you turn the wheel, a small square dot slides up or down in an LCD bar that sits to the right of the screen; you're supposed to align the dot in the LCD bar to a choice on the screen, and then click the wheel. Voilà, a pointing device. This feels very retro, like it was made for cosmonauts. It works, but only barely. The pointing device does not, for instance, let you select individual words to look up; you can only click on the line of text that includes that word, and then the Kindle will download definitions for each of those words, which is slow. Graphics: While text looks great, pictures look like they were rendered on a circa-1990 dot-matrix printer. So yeah, you can buy Colbert's "I Am America (and So Can You!)" for only $9.99, but on this screen it and other picture-heavy books won't be worth even that low price. Non-book media: For a fee, you can get newspapers and blogs delivered to your Kindle automatically. Monthly prices are $10 or more for papers, and $1 or $2 for blogs. But none are worth it, because the Kindle gives you nothing more than what you can get for free on the Web. You pay for a print newspaper because it's got more features than an online newspaper. 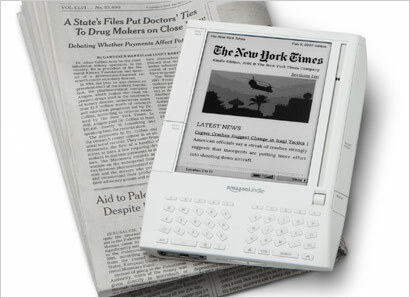 The Kindle version of the New York Times has no ads, but with its poor graphics and pedestrian layout -- just lists of text -- it resembles what the Web version of the Times looked like in about the middle-'90s. It's not worth $14 a month. The Kindle also includes a Web browser that's deemed experimental, but about it the less said the better. It'll work OK on text-rich pages, but most sites look fishy, like surfing on an old cellphone. And what if you want to read your own documents? The Kindle can open plain text files and, using an e-mail-based conversion program that charges 10 cents per file, HTML and Microsoft Word documents. You can't access other kinds of data, though, including PDF files. Presumably the restrictions are meant to keep you tied tightly to Amazon as your sole source of content; in practice, they make the Kindle useless for anything that isn't a book. In short, then, if your main aim is something other than reading books, you're better off buying an iPhone. The price! Considering that it does only one thing, the Kindle is one expensive gadget. That's what people said about the first iPod too, and one supposes that, like the iPod, the Kindle's price tag will fall and its features will grow. But we're not talking about the future. We're talking about now. Should you spend $400 for an e-book reader? Only if you read a lot of books. As I calculate it, if you add in the $400 cost of the device, you'll need to buy at least 40 e-books at $9.99 each to get an average per-book price lower than $20, roughly the cost of a standard bookstore hardcover. If you're sure you can read at least 40 books over the life of your Kindle -- let's say five years, so eight books a year -- then sure, go ahead and buy one. You'll save money in the long run, not to mention 40 books' worth of shelf space. If you're not a book fanatic, though, there seems no point to this device. Yes, it's pretty rad to be able to get a book right at this instant. But if the book's at all good, you can afford to wait. Every week we Salon scribes do a short video segment for Current TV. This week I discussed the Kindle.